Heat is always an issue when dealing with an air cooled Harley Davidson. The Big Twins today push forty + more torque than the Evolution motors of the 80’s & 90’s. More torque, of course, means more heat. The oil capacity across in the Harley oil pan and all models for that matter has always remained very much the same. Fix My Hog videos cover the options of fans, like Love Jugs, Master Cool and Jims Forceflow. We have also covered the option of oil coolers such as Ultra Cool. Now we have another option for our Big Twins in Baker’s +1.5 quart oil pan assembly to replace the Harley oil pan. Baker’s two piece oil pan adds a quart and a half more oil to the oil system of your Touring model. More oil capacity means better heat dissipation. This is not just a larger oil pan. This is a well thought out, engineered design. The Baker’s pan sections are designed as a labyrinth. Oil is dumped into the front, top pan and travels through three pan baffles, to the rear. Oil, then, drops to the bottom pan where oil is cooled further as it moves across larger, internal, pan baffles before being returned to the motor. To aid in cooling the +1.5 has cooling fins in the front and rear giving more surface area. The Baker pan really fills the bottom of the Touring undercarriage. 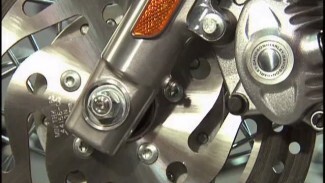 It comes in at 2 3/8″ wider than the stock Harley oil pan. In testing, the Baker oil pan had an average of a 16 degree temperature drop. The average drop in temperature was 20 degrees in stop and go traffic. Best reductions in heat were found in the, warmer, Southern United States. The Baker oil pan assembly is easy to install. 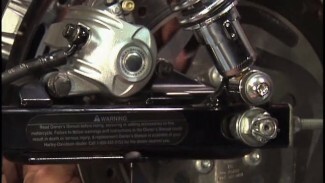 You will remove your mufflers, exhaust crossover, axle, and belt guard. In order to give everyone a good view, Bob and Mark removed more than necessary. The entire primary drive will be left untouched. If you are trying to cool down your Harley Davidson, Baker’s + 1.5 oil pan is an excellent solution. Let’s get started by removing the stock Harley oil pan.